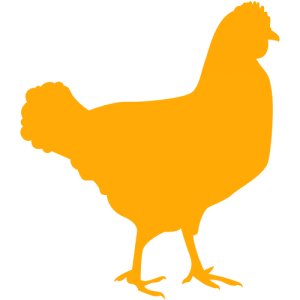 A hen requires 24 to 26 hours to produce one egg. Thirty minutes later, she starts all over again. About 280 million laying hens produce approximately 6.1 billion dozen eggs per year in the United States. White shelled eggs are produced by hens with white feathers and ear lobes. Brown shelled eggs are produced by hens with red feathers and red ear lobes. If an egg is accidentally dropped on the floor, sprinkle it heavily with salt for easy clean up. During the spring (vernal) equinox (about March 21), it is said that an egg will stand on its small end. Although some people have reported success, it is not known whether such results were due to the equinox or to the peculiarities of that particular egg. Yolk color depends on the diet of the hen. Natural yellow-orange substances such as marigold petals may be added to light-colored feeds to enhance colors. Artificial color additives are not permitted. Occasionally, a hen will produce double-yoked eggs throughout her egg-laying career. It is rare, but not unusual, for a young hen to produce an egg with no yolk at all.